Lock in a great price for Lappeenranta Spa – rated 8.5 by recent guests! Rooms, quietness, breakfast, rotating sledge on the lake nearby, area around. Breakfast was good (local products) and it would had been possible to have different coffee e.g. on request. The service was good and I enjoyed the breakfast. The room was pretty clean and nice. Perfect location if you are taking the boat for Russia. We stayed here before and after going to St. Petersburg. Location to boat dock for canal trip to Vyborg was excellent. We felt very comfortable leaving our car and extra luggage at the hotel while we took the canal trip. The staff were so friendly and helpful that we hated to leave. Breakfast was delightful.You made our first experience in Finland a memorable one and we would love to return some day! the old spa part of the hotel where i had my room was excellent: beautiful building and room with a nice lakeview. the hotel spa is small but never crowded. good for relaxing time. the hotel restaurant was also good and staff friendly. location just by the lake where lots of activities in the summer. View to lake Saimaa. Liked the old building. Staff was very friendly. Perfect location. If you are a very good sleeper and you are not annoyed by anything while sleeping this is your hotel! Breakfast was good enough. Lappeenranta Spa This rating is a reflection of how the property compares to the industry standard when it comes to price, facilities and services available. It's based on a self-evaluation by the property. Use this rating to help choose your stay! 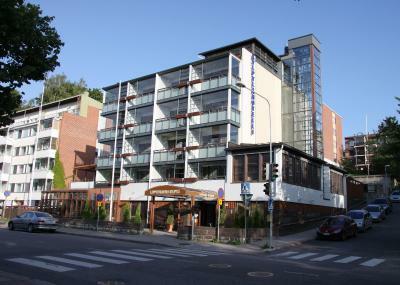 One of our top picks in Lappeenranta.This central Lappeenranta spa hotel is on the shore of Lake Saimaa. It provides free pool and sauna access. All rooms have free internet. The air-conditioned rooms at Lappeenranta Spa include a TV, work desk and mini-bar. Some also have a spacious balcony. Rooms are located in either the historic spa building from 1912 or the modern spa building. Massages and spa treatments can be arranged on site. Bicycles, Nordic walking poles and snow shoes can be rented at reception. Theater tickets or transport can be arranged on request. The on-site restaurant Bistro Lähde offers a breakfast buffet in the morning and an a la carte dinner menu. Guests can relax in the lobby bar. Lappeenranta Spa Hotel is within 20 minutes' walk of Lappeenranta Station. Lappeenranta Airport is 2.5 mi away. This property also has one of the top-rated locations in Lappeenranta! Guests are happier about it compared to other properties in the area. When would you like to stay at Lappeenranta Spa? Located in the spa building, this air-conditioned room includes a multi-channel TV and fridge. Located in the spa building, this spacious, air-conditioned room includes a multi-channel TV, mini-bar and bathrobes. Set in the historic spa building from 1912, this air-conditioned room features an electric kettle, mini-bar, TV and bathrobes. Set in the historic spa building from 1912, this air-conditioned room with Lake Saimaa views features an electric kettle, fridge, TV and bathrobes. Set in the historic spa building from 1912, this air-conditioned room with Lake Saimaa views features an electric kettle, mini-bar, TV and bathrobes. Featuring a lake view, this suite also has air conditioning, bathrobe and mini-bar. House Rules Lappeenranta Spa takes special requests – add in the next step! Lappeenranta Spa accepts these cards and reserves the right to temporarily hold an amount prior to arrival. If you expect to arrive outside check-in hours, please inform Lappeenranta Spa in advance. The hotel need to be updated and renovation urgently. It was quite terrible experience. The walls are like paper, you can hear everything whats happening in next to your room. The hotel consists of two buildings, one opposite other across the road. We lived at the old building, so had to go to breakfasts and spa to another building. But it wasn't big inconvenience. Good hotel with comfortable, quiet rooms, excellent breakfasts. It s just your average hotel, nothing special. Staff was very friendly 😊 Spa experience was with trying. House cleaning was Inapt. Found use towels on the floor rarely if not Cleaned properly Surrounding areas. No changed sheets I stayed there for three night stay. Breakfast was served in a rather boring room and it was quite basic . I stayed at '' old side '' of the hotel , the wooden building and the room ware very lovely and beautiful . My room had amazing view to the lake . Dust on top of the wardrobes (about 1.8 m above the floor). Pool was closed for sanitary cleaning during our stay. Good breakfast, excellent location. Extremely friendly stuff. Close to city centre. very close to city center , the location was quite central and close to the lake and to the local park. Paid parking. That should be free for guests. No restaurant in hotel. The hotel is about 20 minutes walk from Lappeenranta train station, which is OK. But will be a bit far if you have luggage with you. Just a bit expensive, but its ok in Finland. It is very close to the city centre of Lappeenranta. The room is very spacious and clean. The bed is very comfy. They have free spa and sauna, but due to time limit, I did not do it. Overall, the chilling activities in this hotel seem very cool!